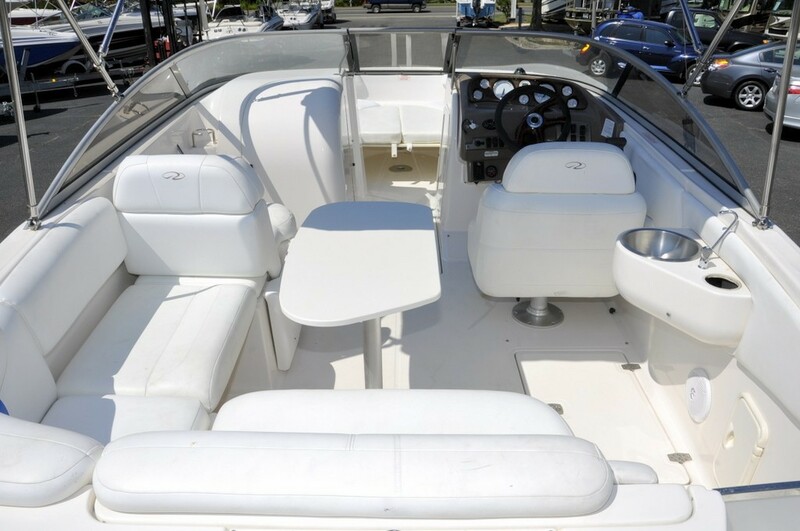 If your destiny is to rent a luxury boat you may be in luck because our Regal “Destiny” bowrider is ready for you! Regal boats are often compared to Mercedes-Benz cars - this is also the case here. 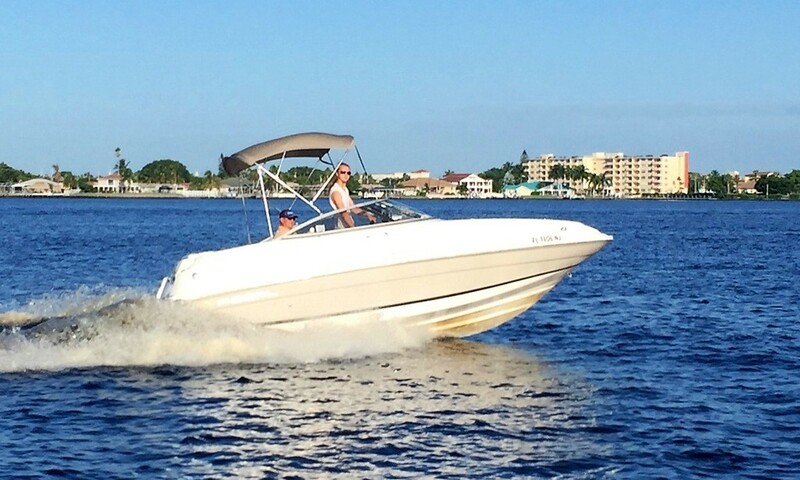 A sleek 22.5 foot boat with beautiful workmanship and a big powerful Volvo/Penta model 5.0 GXI engine producing 270 HP via a stainless steel prop thus quick and fuel efficient at the same time. As expected here the hull provides quiet travel through even moderate seas something rather expected of larger boats. 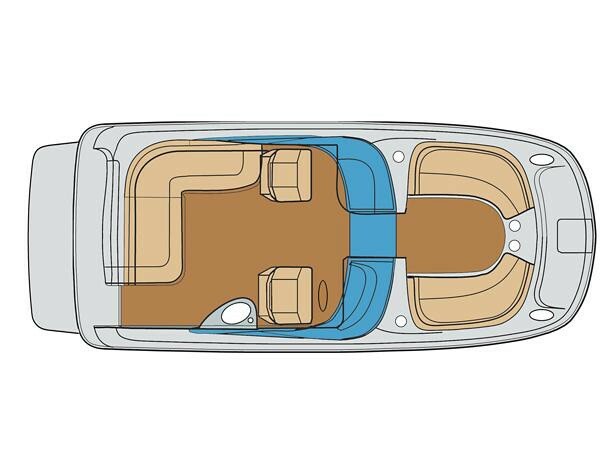 In the bow one can set up the extra cushions to create a large sunning area and a table can be set up it the front or rear seating areas. 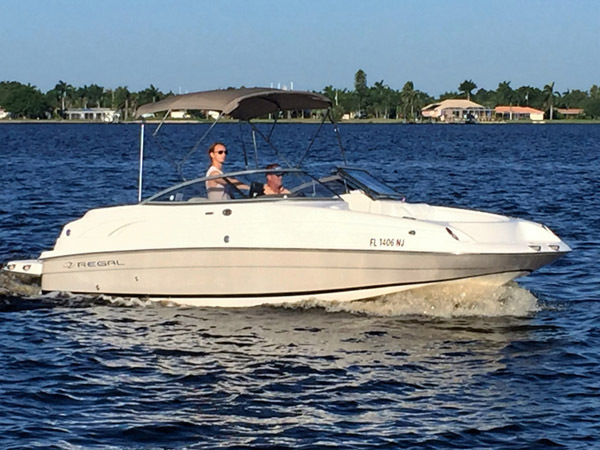 There is comfortable seating for 9 people, under the Bimini top or in front under the sun. A large swim platform and a fore and aft swim ladder offer easy access to the water. The AM/FM/CD player allows you to set the mood you want. The Destiny even has an on-board head that includes a toilet and room for a quick change. The color GPS, together with the depth finder assure safety and convenience on board. Our standard boating accessories along with all US Coast Guard safety equipment is on board and readily available for a safe and carefree day of boating. So remember boating in Ft Myers and Cape Coral Florida is pure fun on a Regal! Reserve Mannis’ Destiny today! Delivered to your dock. 2 day minimum rental. Note: All prices and fees are subject to change. *First Name, Last Name, Phone and email fields are required.